In 2009 I returned to college to finish a degree that had been lingering in the nether sphere for nearly fifteen years. I was at a crossroads in my life and I realized that the only way to move forward was with that degree. In today’s work environment, you generally need a minimum of a bachelor’s to compete and often a master’s or better depending on the field. I had first set foot on the campus in 1988. I was a senior in high school when I went for my first visit. The university and I clicked in some way and that’s where I decided I wanted to be for the next four years. However, four years stretched into five, and I found myself floundering in my studies. Not only was I working full-time, I was also starring in my very own Lifetime movie: I called off my wedding only to be blindsided when my fiancé married someone else a short time later. I would say I dodged a bullet there, but it was really more of a boomerang than a bullet: he got divorced and I married him a few years later. And then we got divorced. Somewhere in the midst of all that, I decided to take a semester off. One semester led to another, and without ever deciding to quit, I just never went back. Flash forward to 2009, the year of my 20th high school reunion. I was a single mother of special needs twins. I hadn’t worked full time in 10 years and I was staring down the barrel of a bleak job market. My sister graduated from law school that year and the tone of her speaker’s commencement address about their job prospects was so grim that I don’t know how any of the graduates found the strength to walk to the stage and accept their diplomas. I expected there to be some kind of trauma room made available so they could all convene there and just quietly rock themselves. So I made the decision that I would return to college to finish that bachelor’s degree in order to make myself as competitive as possible and to seek opportunity where I could. I was very nervous returning to school after my 15-year absence. The school had changed, the students had changed, I had changed. I would be on campus with kids young enough to be my own children. I knew that I was not in Kansas anymore when I sat down in my first class and, as the professor started speaking, I looked over and spied the young lady next to me texting with her cell phone in her lap. Without looking at it. Her thumb flew over the keypad and she never took her eyes off the professor. That was a skill set I felt unlikely to acquire, and I hoped desperately that it would not be needed. I spent the next two years juggling work, school, and motherhood. I had classes with others like myself, returning to finish or acquire a different degree. Including it turns out, an old friend. We were in college together the first time, but she had finished and graduated with a degree in computer science. Now she’s a mother interested in being on the same schedule as her kids; she came back to school to get a degree in secondary education in order to teach. I also had classes with fresh-faced youngsters, including one young lady who assured me that feminism was “like dead now because everything is like equal now.” I suspect she can text without looking. What is interesting about returning to school as an adult is your perspective. At this point I don’t perceive college as a way to embark on a glittering career. I intend to market myself as creatively as I can, based on my skills and interests. The degree is a necessary tool to that end. Interestingly the intent of higher education is to prepare you for a career, but so often a person leaves school and gets a job. And that job leads to another kind of job, and so on. I actually know very few people who have what I would term a “career.” I wish the schools did a better job of revealing to students that there is an entire universe of jobs to choose from. Also, most of the jobs in the world are jobs that you’ve never heard of. And more importantly, your job may not be obvious at first because you haven’t created it yet. Some people are lucky: they know what career they want, plow through school accordingly, launch into the marketplace—and the rest of us are left to stand in their dust. But many people begin in one field and drift into another. For a long time, I felt ashamed that I had failed to complete my degree. 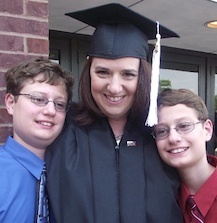 But then I learned a great lesson from my sons. You see, my sons love trains. They love trains in a way that is impossible to really understand until you have met them and you are inundated with information about the British rail line and the origin of the steam engine. In stereo. The beautiful thing about trains is that even when they are traveling over tracks they’ve traveled before—even when they travel back to where they’ve come from—they are always moving forward. I graduated on May 7th. I don’t know that the job market is any better than that commencement speaker painted it two years ago, but I am armed in a way that I was not then. I’ve boarded a new train and I’m traveling forward, despite the fact that I have never learned to text without looking. Photo provided by Amy Redd-Greiner. Great essay! Good luck and keep moving forward. Excellent! Texting without looking ain’t that special. Working, raising two kids, getting an education, maintaining a household, and staying sane are incredibly special, as are you. Great essay.